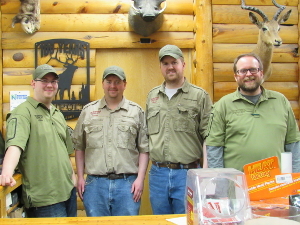 Hunters Outlet in Thief River Falls, Minnesota, is fast becoming a favorite shop for hunters and shooters of all ages. They have the largest inventory of firearms in the area with over 1,800 new and used firearms on hand, full-line of ammo, reloading, muzzleloading, optics, bows and archery accessories with pro-staff services, tree stands and blinds, gun cabinets and safes, clothing, and hunting and shooting accessories. We buy in large volume to keep our prices down with warehouse facilities to store our inventory. This enables us to pass along a substantial savings to our customers. We have better prices than anyone in the industry on gun safes, gun cabinets and tree stands. Hunter’s Outlet not only competes with big box store prices but often is substantially lower. We cordially invite you to stop by and see for yourself. We think you will find us extremely competitive and our friendly knowledgeable staff is always ready to answer your questions and help you find what you need. We are a retail store located in Thief River Falls, Minnesota, serving hunters and shooters in Thief River Falls, Red Lake Falls, Crookston, Roseau, Bemidji, Bagley, Minnesota, Grand Forks, North Dakota, & Everywhere in between.